Cali-R mainly celebrates the 70's disco era of The California Ballroom but this page is to remember the fist decade of the Cali when legends like The Rolling Stones, The Who, Dusty Springfield and hundreds more all appeared there. 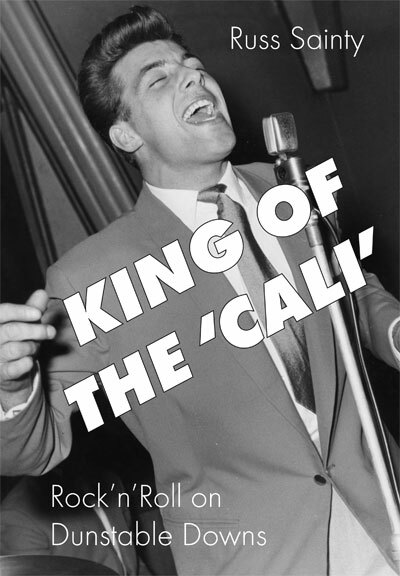 CALIFORNIA Ballroom legend Russ Sainty rolled back the years on Friday night with a rockin' party to mark the launch of his autobiography, King of the "Cali". 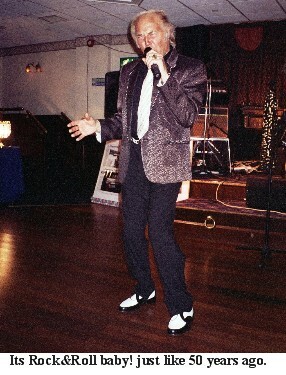 Even at the age of 72, Russ is still the consummate showman; and the man who headlined when the Cali opened its doors in March 1960, going on to perform a record 338 spots at the dance hall until 1965, showed an enthusiastic audience of fans, friends and family at the United Services Club, Dunstable, why he and the Nu-Notes were such a big attraction for so many years. 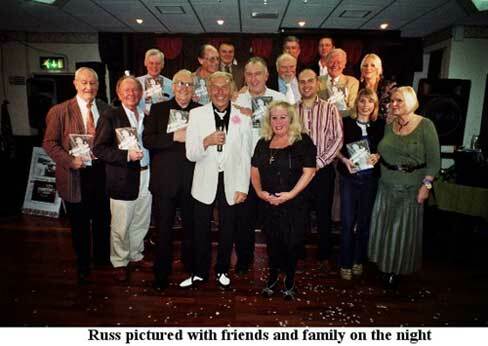 It was a night, staged by Cali-R Promotions, of unashamed nostalgia as Russ performed hits from the 50s and 60s, as well as showcasing the time he spent in musicals and in cabaret. 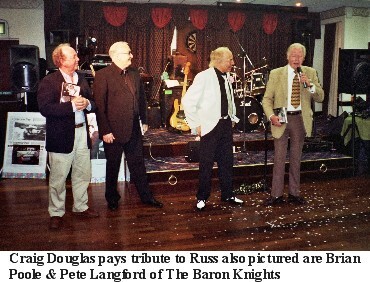 And helping the night along were some of the friends he has made throughout 51 years in the music business, including Craig Douglas, of Only 16 and When My Little Girl Is Smiling fame; Brian Poole of the Tremeloes; and Pete Langford of the Barron Knights. The trio paid tribute to Russ and all credited him and the Nu-Notes with setting the standard of professionalism and musicianship to which they aspired. Also present were two of the Nu-Notes – bassist Mel Miller and drummer Bernie Martin. Sadly, two guitarists Roy Toft and Roger Dean have died, and the other, Rhett Stoller (who wrote the Match of the Day theme tune), has lost touch with his former group mates. 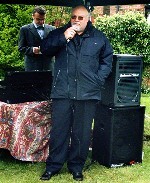 Russ presented copies of his book to all his friends -- and also to Stuart Goodyear, who played in the Ray Miller Orchestra in the early days of the Cali and wrote A Hatful of Music about the area's dance bands; Radio Caroline disc jockey Del Richardson; Susan Toft, the late Roy's daughter; and Cedric Green, son of Edwin Green, the man who built the Cali and booked Russ for the opening night – before embarking on a marathon book-signing for fans while rock'n'roll group Levante kept the music going. Said Russ: "It was a real fun party night, and hopefully we sold a few books as well! I was really proud to be asked by Paul Bowes of the Book Castle to write my story. It ain't Shakespeare, but it's written straight and true from the heart. It's direct and it records exactly what the music scene then was about." In the book, the man who has been named as one of the official founding fathers of British rock'n'roll reveals how he turned down the chance to record a Lionel Bart song because "I had to be up early for work in the morning"! Although he doesn't say so in the book, because he has no proof, he now believes that this decision cost him the chance to make one of the best-selling records of all time. He told me: "I met Lionel Bart in December 1958 and he wanted me to record a song he had just written, and I stupidly turned him down. A month later Cliff Richard had recorded Lionel's Living Doll and had a big number one with it. I've always believed since that it was Living Doll that he was offering me. It was the sort of song I was singing at that time. I still wonder to this day whether I turned down the biggest chance I would ever have to get a hit record!" But Russ has no regrets: "I'm an enthusiast. When we started we were never in it for the money. It might seem tame and innocent now but rock'n'roll then was controversial and revolutionary. We were doing it because we loved it. And that's stuck with me ever since." 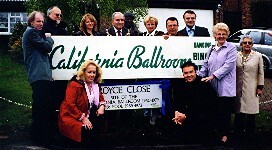 The official ceremony to unveil the memorial sign for the California Ballroom, took place on May 5th 2004 and was covered by BBC Three Counties Radio and the Dunstable Gazette. This is the memorial sign for the California Ballroom which was erected by the council after campaigning from the Cali-r.
Pictured above is the original California Ballroom sign and the new memorial sign. 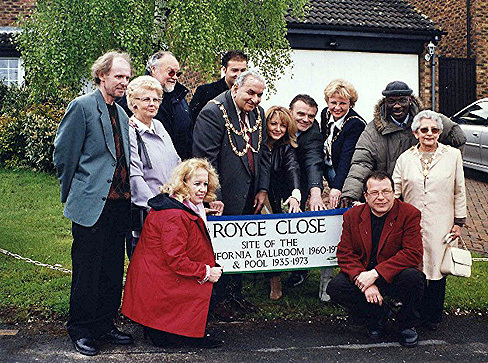 Also in the picture are the Green and Ilka families with the Mayor and Mayoress, leader of the town council and former California Ballroom DJs. 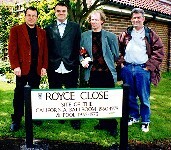 Former California Ballroom DJs Louie Martin, Sid Hudson, Mr H and Sixties and Seventies Ballroom Fan Jack Saunders. 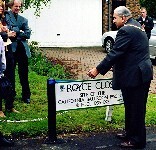 The Mayor officially opening the California Ballroom memorial sign. Cedric Green, son of Eddie Green who built the California Ballroom. 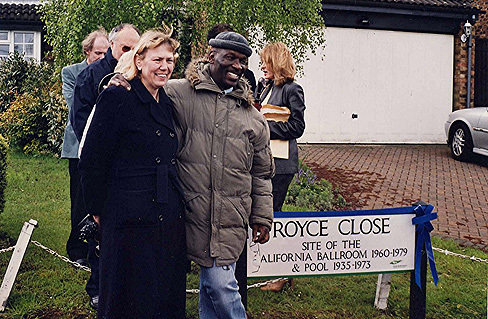 Thanking the people of Dunstable for remembering his father's hard work and keeping the Cali name alive. 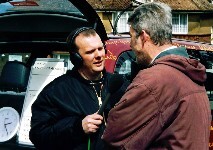 Cedric fully endorses the Cali-R.
Martin Coote interviews Jack Saunders live on BBC Three Counties Radio who along with lots of other people were reminiscing about the old days at the Cali. The CALI ALBUM is full of pictures and memorabilia of the California Ballroom which was the heartbeat of 60s & 70s youth in Bedfordshire. Thousands of people from all over the country flocked to the bottom of Dunstable Downs for the unique Cali experience.